Talisman drawn by the Bab; not identified. This image is small because it was scanned in 1997, when monitors were much smaller and bandwidth more limited. Originally posted at www.mashriq.org/irfani.html [archive.org]. Written in Arabic and English. This is an unidentified pentacular and circular shaped talisman drawn by the Bab. 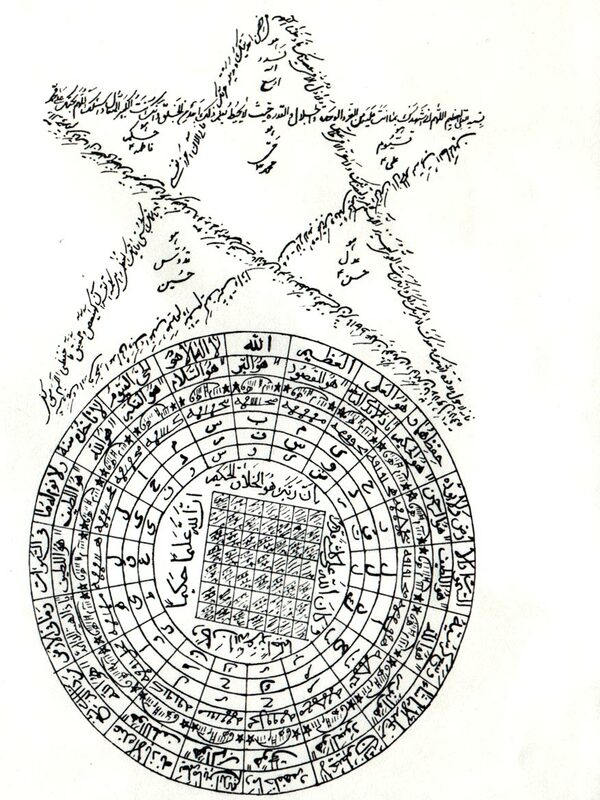 Da'ira and haykal both mean "talisman," the former being specifically a circular talisman and the latter being (usually) pentacular or square. Peter Smith explains that "the idea that physical object can provide the wearer with some form of supernatural protection" is common in religions around the world. "The Bab instructed his followers to make and wear talismans, and there are numerous references to these in his writings." While the Bahá'í teachings de-emphasize such esoteric practices, there are prayers and other Writings that mention or provide talismanic protection. (Concise Encyclopedia of the Bahá'í Faith, q.v. 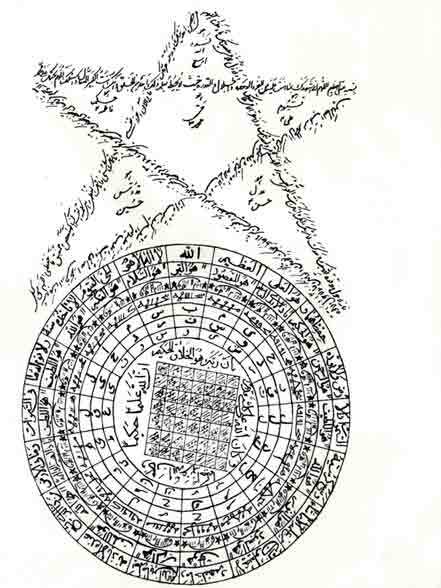 talisman) Khazeh Fananapazir adds that in the Persian Bayan the Bab refers to men as "those who possess the hayákil ('ulu'l-hayákil)" and women as "those who possess the dawá'ir ('ulu'l-dawá'ir)" (bayán-i fársí IV:4-5)."